Asian Agri kicked off the oil palm replanting programme with smallholders and government officials in a replanting ceremony on 20 April 2016. 135 members of the Mulus Rahayu Cooperative for smallholders had the honours of being the first palm oil smallholders in the country to receive replanting funds from the Indonesia Government. This was especially significant as Asian Agri is the corporate partner to these Plasma smallholders, having also guided them to achieving certification from RSPO and ISCC. The Indonesia Palm Oil Estate Fund Agency (BPDPKS) disbursed replanting funds totaling IDR 6.75 billion (USD 510,000) on behalf of the government to the smallholders. See news releases for more info: Here and here. 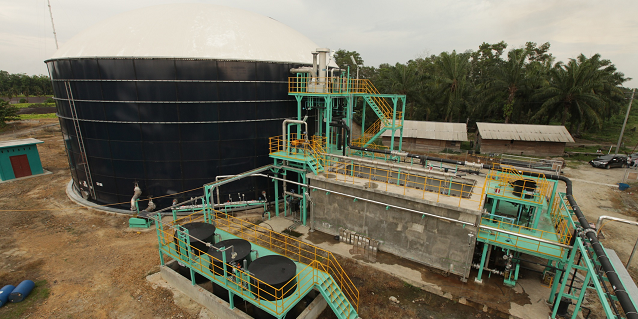 Asian Agri’s Managing Director Kelvin Tio said this is a successful example of strong public-private partnership in Indonesia. With almost three decades experience of smallholder collaboration, most of whom are under the Plamsa programme, Asian Agri has played a pivotal role in improving smallholder livelihoods. 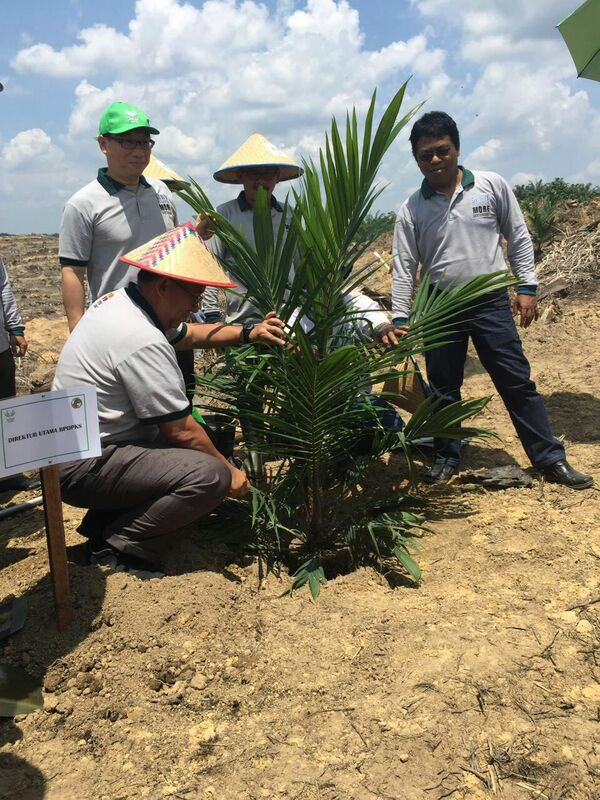 The palm oil producer will continue to support the replanting programme, covering 2,402 hectares of smallholder plantations in 2016 and 4,000 hectares in Riau and Jambi in 2017. Presiding over the replanting ceremony, BPDPKS President Director Bayu Krisnamurthi said that multi-stakeholder involvement remains important to the oil palm replanting programme, and that continuous collaboration between various parties is required to effectively manage sustainable palm oil plantations. 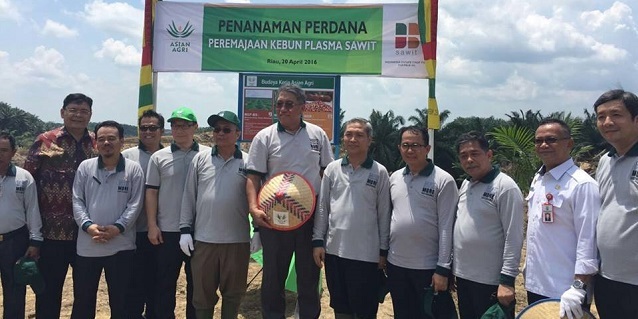 Smallholders from Kerinci Kanan, Siak District, Riau received Topaz seedlings from Asian Agri, which has since 2002 been planting these seedlings. The result of research and development, these Topaz seedlings have proven to effectively increase oil palm yield by up to 50 percent. Smallholder plantations undergo replanting at the tail-end of the palm oil plantations’ 25-year commercial lifespan. Mr Bayu Krisnamurthi said this is an opportune time to rejuvenate the industry to not only raise productivity to meet industry needs, but also foster sustainable development while continuing to improve the livelihoods and welfare of smallholder communities. Asian Agri has since 2008 actively supported the smallholders replanting programme. This includes training and helping smallholders seek alternative sources of income during the replanting period, such as cultivating livestock, poultry, horticultural plants and other crop farming. 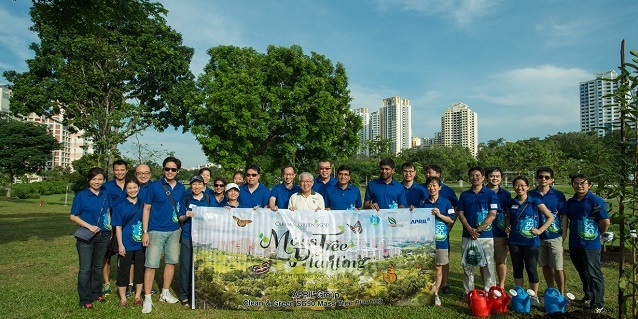 As a sustainable development advocate and recent member of the Fire-Free Alliance, Asian Agri has also supported partnered smallholders with machinery for fire-free land clearing. The disbursement of the funds by the BPDPKS is also indicative of the Indonesian government’s support of the sustainable palm oil industry.